It’s ironic that MobileMe couldn’t be accessed via Mobile Safari. 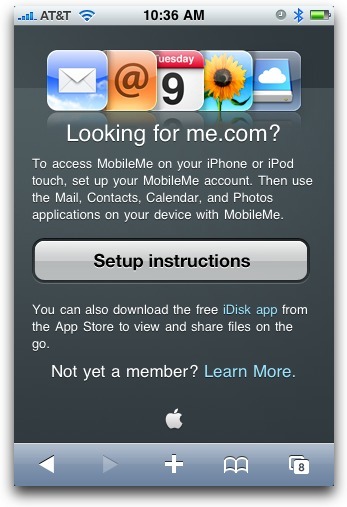 MobileMe’s me.com Web site used to offer up an error page with a link to information on how to set up an iPhone or iPod touch for synchronization. Apple has now changed that welcome screen for its mobile devices, alerting the world via a Knowledge Base note that we found out about via Macworld. 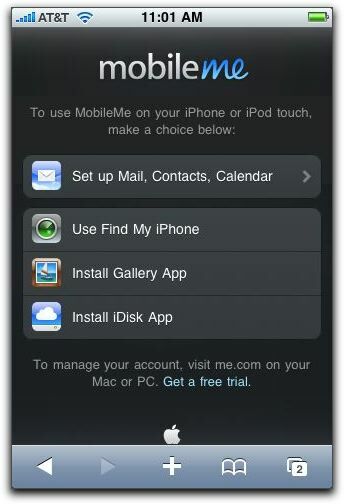 While requiring sync for email, contacts, and calendar might be acceptable – even if I would like to have the option to use MobileMe’s Web apps on someone else’s iPhone or iPod touch – Find My iPhone/iPod touch couldn’t be used via Mobile Safari. 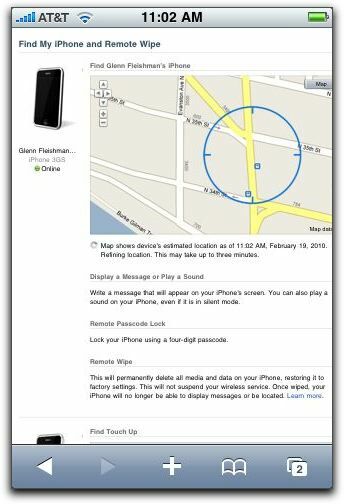 If your iPod touch or iPhone were lost or stolen, you couldn’t use someone else’s iPhone to find yours! (Adam Engst described a workaround in “Use Find My iPhone from an iPhone,” 30 September 2009.) I wonder if an Apple executive discovered this lacuna when his or her phone was missing. The revised Mobile Safari welcome screen for me.com is better organized. The link to setup instructions for synchronization is still there, but there are three additional buttons: Use Find My iPhone, Install Gallery App (to access your MobileMe Gallery), and Install iDisk App (for file access). When logged in, you see the full main interface for a moment, after which you’re redirected to the Find My iPhone/iPod touch page. That page also isn’t optimized and you have to zoom and expand to read the page’s contents or activate functions like wiping your phone remotely or locking the phone with a four-digit PIN. Apple should still improve this process, but making Find My iPhone/iPod touch viewable via Mobile Safari is at least a step in the right direction. I was holidaying at a Caravan park recently. I only took my iPod touch because the park had WIFI. However, although Safari worked, something was blocking email through the email app (possibly only sending - I can't recall fully). Mobile Me would not let me look at my email via safari like I could have done on my Macbook - it was very frustrating. I agree that Apple needs a better way to use Find my iPhone from an iPhone (perhaps a dedicated app?) Twice while trying to enlarge the screen that was too small to read, it offered to remotely wipe my wife's iPhone (who I was trying to locate on my iPhone). Fortunately I was able to tap Cancel in both cases, but if I had been rushed I might not have noticed. This interface must have been designed by an MS-DOS programmer.